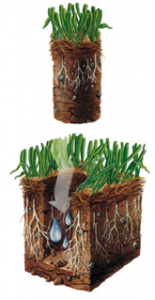 What is aeration and why consider it? Although the term sounds exotic and complex, aeration is like a spa treatment for your lawn. It does the equivalent of opening up skin pores and removing what’s plugging them up. Two of the most common lawn care problems in the Lower Mainland are compaction and thatch. Over time, a healthy lawn can become hard-packed when it’s trampled over or used for sports. This is called compaction. A boggy lawn that pools water is one sign of it. Thatch build-up is another way that a healthy lawn can deteriorate. Thatch is a thick layer of stem, debris, clippings and root that is directly below the grass blade. Left untreated, a lawn that is compacted or has a thatch problem doesn’t get the air, water and nutrient at the root level. And it becomes vulnerable to weed, insect and disease. What is core aeration and how does it work? It’s a machine process that uses no chemicals. Core aeration removes small clumps of soil, which are then deposited on the surface (they’ll work their way into the grass within a month). This breaks up the compaction, leaving small openings for water and air to penetrate to the root zone. There are two times of year to consider aeration: spring and fall. In spring, the best time to start aeration is before your grass enters its major growth spurt. An aeration window could range from February to June. The rule of thumb is to aerate when the soil is not water-logged and after you’ve mowed it a few times. Core aeration machines that look like snow blowers remove the hard-packed soil and thatch. They don’t just push holes into your grass like the foot-powered manual aerators. 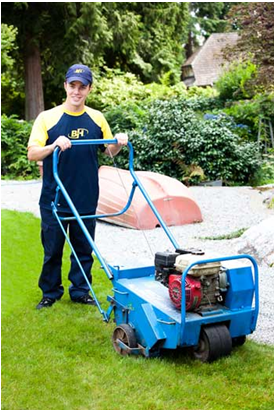 You can rent aeration equipment at a tool supply or garden supply store. But this 350-pound piece of equipment it won’t fit into a standard trunk. You’ll need a mini van or truck as well as help hauling it. What should I do before I call for an aeration service? Check for yourself: long roots are one indicator of health. 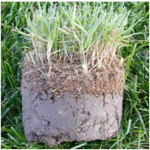 If you dig up 15 centimeters of grass and find short roots (less then 5 cm), your turf may need to be unclogged. Mark the location of anything that’s under your lawn: sprinkler heads, cables, utility lines. Water your lawn if it isn’t raining. Two days of watering are ideal. Push the machine lengthwise, and then widthwise. Apply a top dressing of compost or store-bought manure: rake at least 5 millimeters to fill in the holes. Consider applying seed, lime or fertilizer. This is the best time to help soil and grass. Freshly-aerated lawns are ideal for new seed. 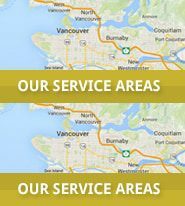 At Bur-Han, we can take care of the entire process for you. Interested in booking an aeration service or learning more? Give Bur-Han a call.